Julie Linge-Smith graduated from City in 2015 with BSc Radiography (Diagnostic Imaging). She’s now professionally recognised by the College of Radiographers and is working in the NHS. - Working with A&E patients on a 24 hour basis and portable x-rays throughout the hospital. 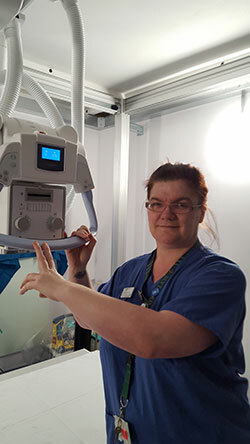 - As part of my role we are also required to work within theatres, imaging as and when the surgeons require us, this is harder than general x-ray as the machines we use are bigger and we have to be constantly aware of the sterile environment around us. 2. What happens on a typical working day as a radiographer? Depending on where we are posted to (either theatres or generals) our day starts with cleaning the room/equipment and checking the warning lights are working outside the doors. We then start sorting out our work list, this is ongoing throughout the day as and when patients come along for their appointments. Inpatients are seen in one room, whilst clinic, GP and emergency patients are seen within the other 3 rooms. We normally work in pairs within the room so whilst one person is x-raying the current patient, the other radiographer is getting the next one ready by checking the patient is appropriately changed and any metal, like jewellery, is removed in advance. Each day is different, depending on which clinics are running and the volume of emergency and GP patients. 3. How did you develop an interest in Radiography? I have worked within the NHS trust in Essex since 2007 as a radiology assistant, working with sonographers, radiologists and radiographers. By 2010 having worked closely with the sonographers and radiologists I found an interest in ultrasound, after researching how to become a sonographer it was clear that there was no direct entry degree for this and I would either have to go through general nursing, midwifery or radiography. I chose to go the radiography route as I was already working within that environment and felt it would be an easier transition. 4. How did your degree at City prepare you for working life? City was really the only university that I wanted to study at, the main reason being that I would have the opportunity to train in Essex hospitals. During my degree I was based at the university for the first year until the last 7 weeks when I went on placement. This means that when you get to your clinical site you should be fully prepared and more confident in your abilities. City helps you to prepare for this by allocating time in the clinical skills suite within the university. This includes a working x-ray suite, an ultrasound room and for the radiotherapy students a working VERT (virtual environment) room. Here you learn about radiation levels, positioning and anatomical land marks to look for when positioning your patient. The lecturers run these sessions in small groups which allow you time to understand what is required of you when you finally get to your clinical site. 5. Were there any lecturers who really inspired you? There was one particular lecturer her name is Soph Willis she was brilliant, really engaging the students in the lectures. Soph was very approachable and patient. She encouraged me to go for the student representative role in my second year and I was lucky to be voted in. Soph supported and encouraged me and worked closely with all the reps in trying to make our time at university an outstanding experience. Soph was always there for me whether in person or through emails, listening and offering advice when relevant. Her help and guidance helped me to cope with university life. 6. Do you have any advice for radiography offer holders? The main advice is do not worry, I was a mature student and one of the eldest within my year, but City made me feel part of the group right from the start. Do not be afraid to ask if you do not understand, they would much rather you understood something instead of ploughing through and getting it wrong. City want all their students to do well and are willing to give whatever help you need. Finally I would say enjoy it! Join some societies including the radiography society. They arrange social events, which allow you to all mix together and catch up outside of your teaching hours.